Cyber Security Minister James Brokenshire today backed efforts by West Worcestershire MP to bring investment into Malvern’s ‘cyber valley’. The Home Office Minister was visiting a dozen local businesses which work to protect computer networks in the UK and abroad. Harriett Baldwin took the Minister on a tour of QinetiQ’s cyber threat monitoring control room and hosted a summit of local cyber security businesses. The Minister congratulated Harriett’s efforts promoting Malvern businesses and encouraged a dialogue with his department and the Cabinet Office. Harriett said: “I was pleased to be able to bring together many of our leading cyber security businesses in one room to network and share ideas. “There is a silicon valley. I’d like to think we now have our own ‘Cyber Valley’ which employs many of the brightest brains in the world. The event, which was held at Malvern’s QinetiQ site, was attended by companies including Deep Secure, 3SDL and Borwell which are all based in Malvern. 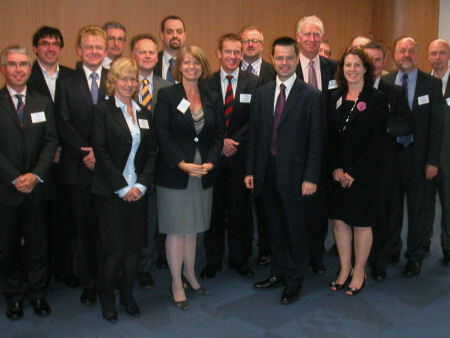 Harriett added: “There are many local small businesses emerging to take on the challenges of becoming the next QinetiQ.